Many had thought or even envisaged that the Owerri court of appeal verdict that nullified Gov. Okezie Ikpeazu’s election declaring his closest rival and governorship candidate of the All Progressives Grand Alliance(APGA), Alex Otti, elected governor of Abia state would have slowed down the pace of many ongoing roads construction and other landmark developmental projects embarked upon by the governor. That never happened as it was never contemplated by the development-oriented governor. Probably, that scenario could have played out if Dr. Ikpeazu occupies the office of the governor of Abia state without the express mandate of Abia electorate. Secondly, if the governor as a person and the good people of Abia, his employers, do not have implicit confidence in the judiciary. Governor Ikpeazu recent activities and official functions at delivering dividends of democracy and overall good governance to the people have largely betrayed the emotion of many bookmakers who had earlier thought that he would temporarily halt his infrastructural revolution and massive road projects ongoing in Aba and other parts of the state in pursuit of his matter already lodged at the Supreme Court by his team of lawyers. The court of appeal panel that decided the appeal filed by Otti and his party, APGA which challenged the ruling of the Umuahia trial tribunal that earlier upheld Gov. Ikpeazu’s election which he won under the platform of the Peoples Democratic Party(PDP) had asked the governor to vacate government house for Alex Otti. That is already vibrating in the public domain. But what have indeed continued to raise loud condemnations both in the political circle and judicial community are reasons recklessly adduced by the revered justices to erroneously declare the APGA gubernatorial candidate winner of the election. One wonders how in the eyes of the law, someone precisely Ahamdi Nweke, a known political jester, who only robotized himself at Umuahia as the state coalition agent for APGA, was able to substantively prove beyond reasonable doubt with whatever evidence tendered before the court that there was indeed over voting in every polling units of Obingwa, Osisioma and Isiala-Ngwa North LGAs. Relying on the so-called evidence, the judges ruled and cancelled the vote of the governor, his family members and that of his kinsmen numbering about 300,000, who indeed registered as voters in three local government areas, to ensure that Otti leads with highest number of votes which he garnered from his Arochukwu local government origin area and other council areas from his Abia North stronghold. For the revered judges again, the ballot of Dr. Ikpeazu and about 300,000 other ballots from Ngwa nation that never produced the governor of the state since its creation even with obvious population advantage should not count in deciding the governor of Abia state. Wether Abia people like it or not, Otti must be their governor. That’s the implication portrays by the court of appeal judgment under our democracy. Okay, our most respected Supreme Court over to you; you and only you have the final word in deciding whom between Dr. Ikpeazu and Otti truly has the mandate of the people to oversee the affairs of Abia state as a governor. 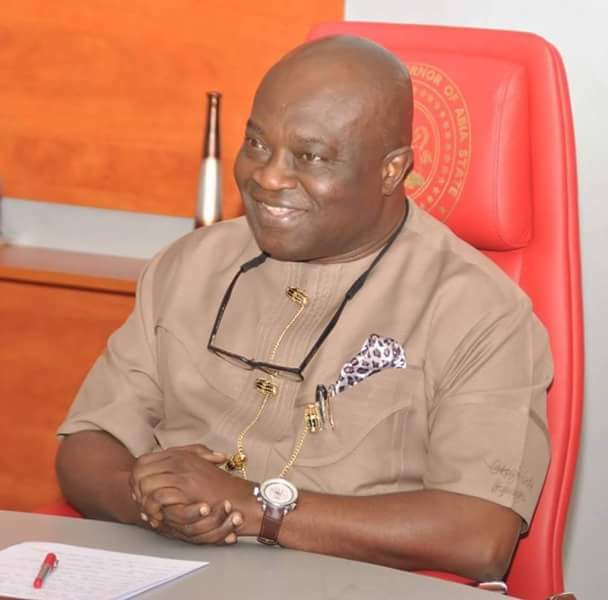 Now judging the activities of Dr. Ikpeazu since the appeal court bombshell, every discerning mind will appreciate and conclusively agree that no other person is divinely positioned to govern and rebuild Abia at this most critical period in the history of our nation. As the biblical David, Dr. Ikpeazu has abundantly showcased wisdom, kindness, perseverance, humility, intelligence, knowledge, simplicity, transparency, sincerity of purpose, accountability, resilience and mostly the fear of God to fast-track development and deliver the much needed social amenities to the people. The massive road construction projects aimed at restoring commerce and entrepreneurship in Aba summarizes Dr. Ikpeazu vision for greater and prosperous Abia state. Precisely on Monday January 11, Governor Ikpeazu strongly reassured Aba residents of his commitment to ensure that the 25 roads currently being constructed by his administration in the city would be completed before the end of the current year. This statement of hope and reassurance came from the governor shortly after commissioning Owerri road by Okigwe road and the Udeagbala road reconstructed by his administration. Before then, the commissioner for Works, Hon. Eziuche Ubani, had revealed that a total of 47 roads were being handled simultaneously in various parts of the state within seven months of Dr. Ikpeazu’s administration. This underscores uncommon strength and commitment by Dr. Ikpeazu notwithstanding the provocative court of appeal judgment. He has thus proven his desire to serve the people as against the glory and excitement that often garnish the exalted office of the governor. Some Aba residents that didn’t vote for Dr. Ikpeazu apparently on petty sentiment have all recanted as they loudly sing the praises of the governor, not because they love his face, but a surest way of showing gratitude to a man that has done much within a short period to ultimately restore the glory of Enyimba city as well as make life more meaningful to the residents. Now what Abians truly owe Dr. Ikpeazu, their amiable governor, remain unalloyed support and prayers. Those that were defranchised by the court of appeal verdict who spontaneously took to the street to protest against the cancellation of their votes castes for their son, brother and kinsman, have indeed sent a strong signal urging the appropriate authorities to ensure that their votes count in deciding who becomes the governor of Abia. The legal luminaries and public commentators have loudly spoken in support to the CJN, Justice Mahmud Mohammed, who didn’t hesitate to condemn and caution court of appeal justices for recklessly churning out conflicting judgments on same electoral matter involving some states including Abia. Nigerians are now anxiously waiting for the Supreme Court to act in defense of our democracy and ultimately restore the sanctity of the ballots of Abia voters.